nudge nudge wink wink bone marrow. Re-fuelling possible on Monday. Stop press! Chemo cancelled again. Anyone for a naked run through the fields? This is getting really silly. Sent home again, 4th time unlucky. Doesn’t have quite the same ring to it does it? Blood count gone down not up. How ungrateful after taking the lazy slackers on holiday over the weekend as well. The most annoying thing is the lack of information on what is causing this and what to do over and above the GCSF injections etc. Lovely Beating Bowel Cancer nurse suggested perhaps my oncologist might want to prescribe antibiotics as I could be fighting a low level infection. Would certainly explain the utter stuborness of my bone marrow to shift over this last 3 and half weeks. It’s all going on inside my body, despite me looking a picture of health on the outside! Lucie however suggested an alternative approach I don’t think I have seen advertised so far which is to run naked through the fields. I am running out of options fast so if antibiotics don’t do the trick, I will seriously consider this and any other suggestions! 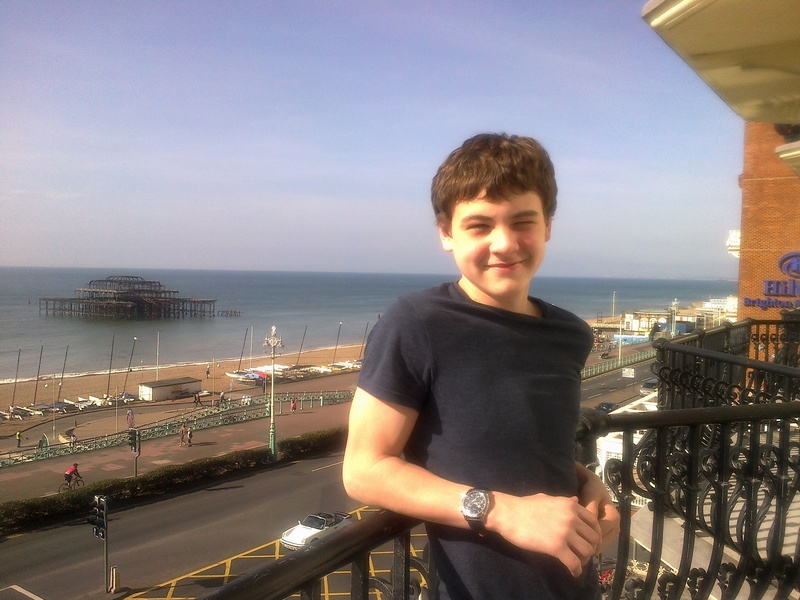 This weekend when our weather knocked cheating celebrities and other matters of national security off the front page of our national newspapers, I went to Brighton with my teenage son, Joe. Used to conversing in complete sentences of only one word, it was a brilliant revelation to find we could hold detailed and long conversations about all manner of subjects from black holes to Bear Grylls; How many bears can Bear Grylls grill if Bear Grylls could grill bears? Bear Grylls can grill one bear on his grill as he only has a one bear grill. Or something like that. Joe’s sceptical attitude to everything and everyone around him was hysterical and I am now totally ‘teenaged’ up on what’s cool or not. (Apparently for reference, just about any make of car other than Aston Martins or Bentleys are gay, as are most clothing outlets with the exception of Superdry or Bench and many other items, too long to list here including the humble ice cream). 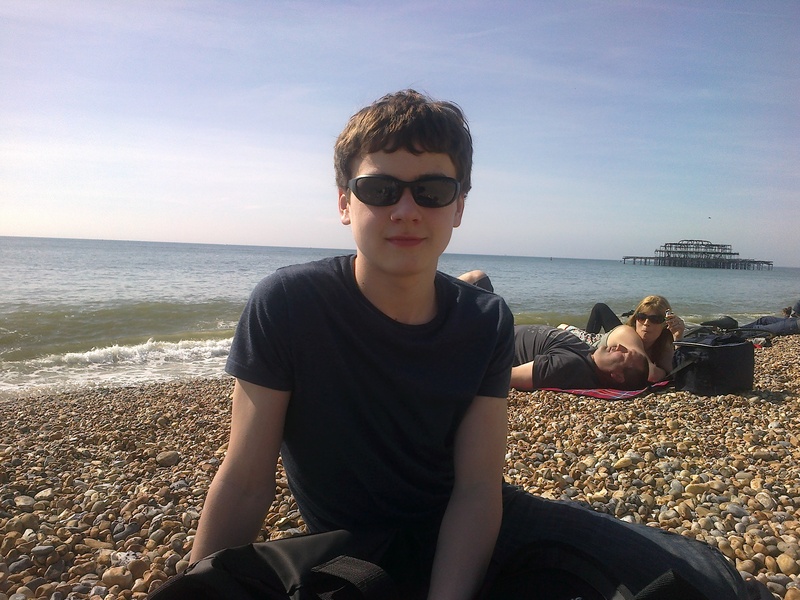 Sadly after the best weekend, we had to come back (him to school and me to the chemo ward), but not before we attracted the attentions of a ‘strange’ individual on Brighton Beach who locked onto us from the thousands around us, like a heat seeking missile. After a rapid fire exchange of information in which we learnt his weight, height, leg injuries, number of sit ups he could do and his prediction that Birmingham will become the new capital of the UK, we made our escape before my left temporal lobe threatened to detach itself completely. With all the delays to chemo, I have felt quite normal for the last 3 weeks and had quite forgotten what it feels like to be so ill, which goes to prove my point about short memories where treatment is concerned. But off for the 4th blood test first thing and if neutrophills are go, I will be spending tomorrow afternoon being nuked. When I re-enter the real world again, I will plot a similar outing with my nearly teenager daughter Lois! And more treats have been lined up; with a bit of luck we will be back in Brighton in a couple of weeks with Lauren and Jo. Can’t wait. Joe shortly before someone threw a cigarette but from balcony above "nearly setting light" to him! I am going to get cured if it kills me! I have been saved from my 6th chemotherapy session by the non appearance again of my rabble army of neutrophills. Fed up with the cost of re-doing blood tests every few days, common sense has prevailed and I am given yet another week to rebuild my strength after the 3rd attempt of chemo this cycle was aborted on Monday. According to my oncologist (who could never be accused of answering a question with an answer), I have a particularly virulent form of bone idleness and there is nothing more that can be done with my bone marrow than wait for it to recover in its own good time. This means I have another unexpected week off and it’s sunny and the skies are blue so after the initial disappointment, I am happy! SuperDad however wasn’t impressed by this “let’s see how it goes” approach, and set up another appointment with my acupuncturist to try Moxibustion as you can do this yourself daily which alongside the chinese herbs, juices and pills, Dad likes the sound of! My poor Mum and Dad have a full time expensive job on their hands looking after me at the moment. So armed with a packet of moxa sticks (made from the leaves of the Chinese herb mugwort) and some diagrams showing the acupuncture points which relate to the movement and stimulation of blood, we set of home to give it a go. There are points up my legs and my tummy which I can manage to reach myself but SuperMum who has a steady hand, needs to be drafted in to reach the points on my back. The Moxa stick once lit resembles a big fat cigar and you need to hold it in place over the point or rotate it in circles and try not to burn the skin. The heat stimulates the acupuncture point and leaves me feeling completely calm and very, very tired. Something is happening, but I have no idea yet what! In the meantime, Jenny and I try puffing on a moxa stick..
Cancer and a lesson in patience! Before cancer, I had never considered myself in any way a control freak and was happy to let chaos theory take over my life. However once I began my new full time occupation of visiting men and women in white suits, something strange happened and to my amazement I tried to think ahead and build a plan encompassing occasional treats, visits and even possibly a bit of work. This has proved more wasteful and pointless than the British water industry. So here’s my advice to anyone trying to plan ahead; think of a number, add 7, triple it, take away the first number you thought etc etc. You might by now be gleaning that today’s 2nd attempt at chemo didn’t go according to plan and my blood has played yet another or it’s hilarious practical tricks on everyone. It started with an early visit to hospital to extract more blood to see if my count had raised enough overnight to hit the minimum quota. Despite Mary Holloway my brilliant reiki lady encouraging me to drink more water, Dad making up even stronger Chinese herbs, Mum pumping me full of protein and Sam (she is without doubt top Needle nurse) hitting the portacath spot first time again AND Jenny turning up to be chemo cady, the neutrophils still said no! Now if you can imagine getting all the little jobs out the way that you know you will not feel up to over the next week or so (and yes this does include tackling the endless, some might say equally pointless stream of parent mail) and then adjusting the dimmer switch inside your head to 75% off energy saving levels, you will understand the frustration of being told “if you could just do that all again next week, we try again”. So now my plans for seeing Bear Grylls with teenage son next Saturday and possibly the end of treatment holiday celebration on 1st June are looking a tiny bit unlikely. Grrr, grrr and double grrr. “What I want to know is why are good people ill and dying, but when I turn on the television murderer’s are still alive?” snippet taken from a conversation in the street this morning. Anyway with Doctor Needles (aka the Bulgarian Vampire) waiting patiently for his next fix of blood, I reluctantly couldn’t even graze the surface of this monster topic before rushing to have my second blood test in 4 days. So feel free to discuss. I am meanwhile getting used to this double think, ‘wanting’ the chemo but secretly pleased when it is delayed due to my white blood count dropping, I presume, like a feather and labelling me neutropenic again. But, I have made the most of the last 4 days good weather, well, as much as one can do smelling of bacteria wipes and avoiding anywhere popular where crowds may gather! Alas, I am provisionally booked in for 11am tomorrow for round 6 of 8. Surely the hurty G-CSF (granulocyte-colony stimulating factor) injections and the even stronger chinese herbs will work this time? I have been informed that the ouchy muscle pain and flu like symptoms I experience for a week or so are a consquence of these bone marrow injections so they had better be doing something more useful than annoying me. The rest of this week is fully booked apparently so I have asked to be put on the waiting list just in case, which my friend remarked is a mightily strange thing to put your name down for. She could understand if I was on the waiting list for a nice restaurant… but chemo, really? All these delays mean the end date for my treatment is continually pushed back and the isolation is doing my head in. Thought about trying to volunteer at the local hospital, but they reminded me that being neutropenic and hanging around the factory where they grow germs isn’t recommended by people more intelligent than me. 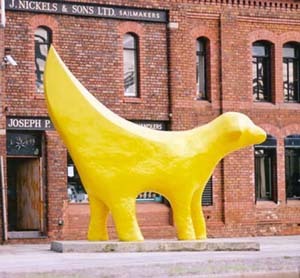 Has anyone else spotted Bananagiraffe’s distant northern cousin, the lamb banana? Apparently they are gambling all over Liverpool at the moment. Makes you wonder why the elephants that sprung up all over London the year before last weren’t Nelly bananas? Surely a lack of imagination London. Tut tut. One can only hope the olympic organisers have taken note and we will see a new banana mutated animal on the streets of London this summer. Being a “little bit under the weather” highlights the very essence of being English. Our national character trait is to be self-depreciating and crazily understated. We would rather chew off our own tongue than be accused of the heinous crime of boasting. Luckily we disguise any whiff of a boast under the cover of “one downmanship” which we show off when discussing anything remotely serious. But… it is still not enough to shrug off our predicament in a dismissive manner; it must also be done in a witty or amusing way. How fortuitous for the English then to posses all the perfect characteristics to tackle the jaw dropping embarrassment of having cancer, or worse still talking to someone who has! It is absolutely forbidden for example to answer the polite enquiry” how are you?” with a “not very well, I have cancer”. This will be met with nervous coughs and raised eyebrows. You will have to be English to appreciate how utterly discomforting those coughs can be. So a better answer perhaps would be “oh, not too bad, had a bit of the bowel and liver out and my body looks like it has been stitched together by the local reception class, but mustn’t grumble, had a few days off work!”. Humour is our favourite coping mechanism and it strikes me we are at our best when we are laughing right in the face of adversity. So give me a dollop of irony, humour, mockery or gentle teasing any day of the week please.